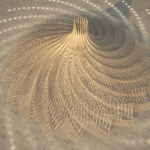 Burning Man, a summer festival located in Nevada’s Black Rock Desert, is something of an architectural bonanza. Each year, dozens of artistic displays and sculptural forms are erected in Black Rock City, the temporary metropolis that hosts the festival. Temples in the past have included a wide range of designs, from pagoda-inspired structures to Wicker Man-eqsue towers. 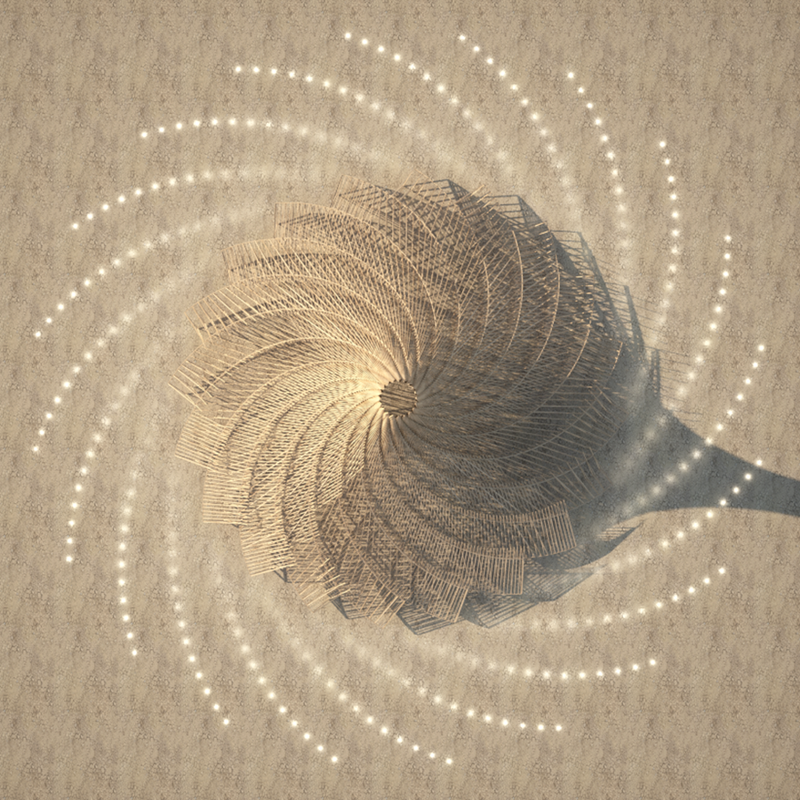 Galaxia, designed by architect Arthur Mamou-Mani a professor at the University of Westminster and the owner of the fabrication laboratory Fab.Pub, has been selected to serve as Burning Man 2018’s main temple. 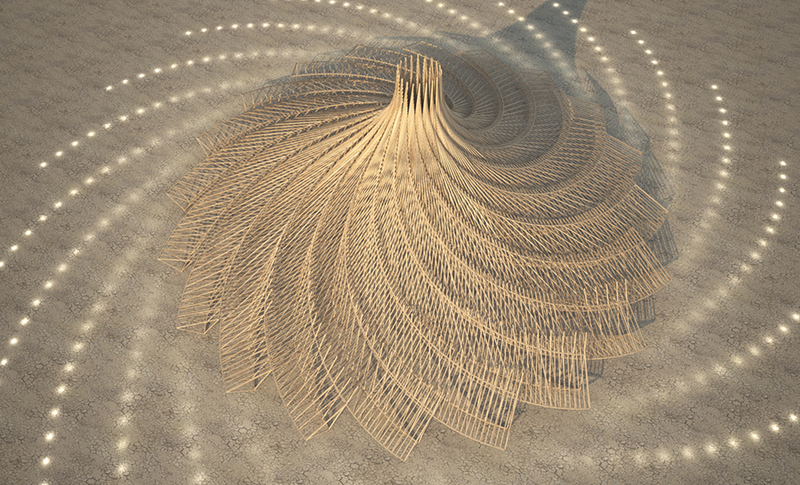 The temple will be constructed of twenty spiraling timber trusses, crowned with a 3-D-printed mandala. A series of alcoves are formed between the timber trusses, allowing spaces of congregation for attendees. 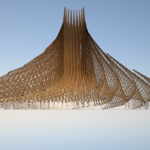 According to the Burning Man Journal, the distance between the timber trusses will be wide enough to facilitate movement to the core of the structure. The Galaxia structure “celebrates hope in the unknown, stars, planets, black holes, the movement uniting us in the swirling galaxies of dreams”–a description fitting for the international designs of the festival as well as the broad scope of its attendance. 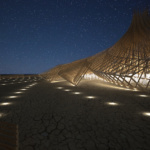 The architect, Arthur Mamou-Mani, has designed installations in Black Rock City for the last six years. 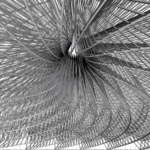 Based in London, Mamou-Mani specializes in digitally designed and fabricated architecture. As reported in the Reno Gazette Journal, the 2018 temple will be pre-fabricated and mostly built off-site as a collaboration between a crew of artists using a range of robotic tools such as 3-D printers, laser cutters and robotic drill arms. 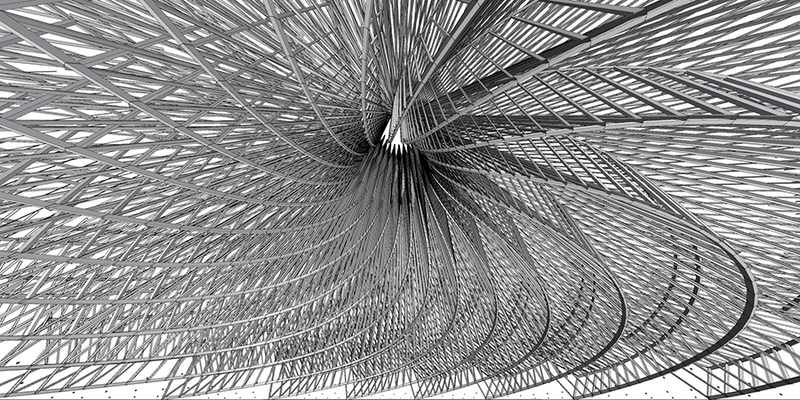 Through this digital fabrication process, Mamou-Mani hopes to reestablish the architect as craftsman, allowing for a closer connection between the design and construction processes. Shipping the interstellar structure will also prove to be quite a feat, requiring the use of flatbed trucks to transport them to the center of Black Rock City. 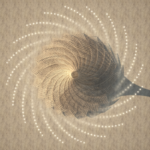 Regardless of the architectural and engineering efforts going into the Galaxia, the structure is nonetheless temporary and will go up in flames on the last night of the festival, in accordance with Burning Man principles.